Are you a patient who suffers from poor bites or crooked teeth? Our Lansing braces can provide effective and corrective measures to help treat individuals suffering from bad bites that hamper eating or speech. Crooked teeth or poor bites, also known as malocclusions, occur when teeth have too much or too little space in the mouth to grow. They can develop in early childhood and persist well into adulthood. Cramped or too-large spaces in the mouth can cause teeth to grow or shift out of alignment over time, resulting in underbites, overbites, deep bites and other problems. At our practice in Lansing, malocclusions are among the first things that a dentist will look for during regular dental check ups, particularly for small children. After malocclusions are diagnosed, treatment can begin with the extraction of certain teeth, in order to make space for other teeth that will eventually grow in time. Traditional metal braces made of titanium and stainless steel help support and straightened crooked teeth. Through the gentle application of constant force and pressure on the teeth, they help move misaligned teeth into place, and provide structure to the jaws and mouth. Another option for teenage and adult patients are clear aligners. These are a series of trays made out of clear plastic that appear invisible when they are placed over the teeth. They work in much the same way as traditional braces, but without metal brackets or wires. Like metal braces, clear trays are custom-made to suit each patient’s individual needs. Dr. Hidlay has been treating all ages of patient suffering from malocclusions for many years, he has extensive experience in all applications of braces. While treatment for malocclusions may undergo, months or years, you can be assured that you will be under the care of an experienced and highly-trained professional. 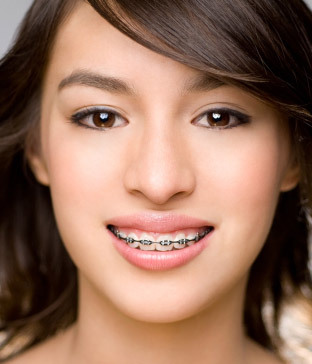 If you need more information about Braces in Lansing, contact us today.